Coming events cast their shadows ... The operators of the mines near Asmara and Bisha long for a transport solution to get their ore concentrates to the harbour of Massawa. The new cement factory in Massawa must bring its products inland and has asked for rail transport. The railway needs to act to meet the demand. It’s crystal clear that railway events like we’ve planned for March 2011 will have an expiry date. No-one is able to tell you when it will be, but there is no doubt that we can’t run such charter trains forever. As we encouraged them to overhaul several two axle freight cars in the last two years it’s now possible to offer a big variety of authentic trains. This time we’re putting the focus on the very attractive central section around Ghinda. 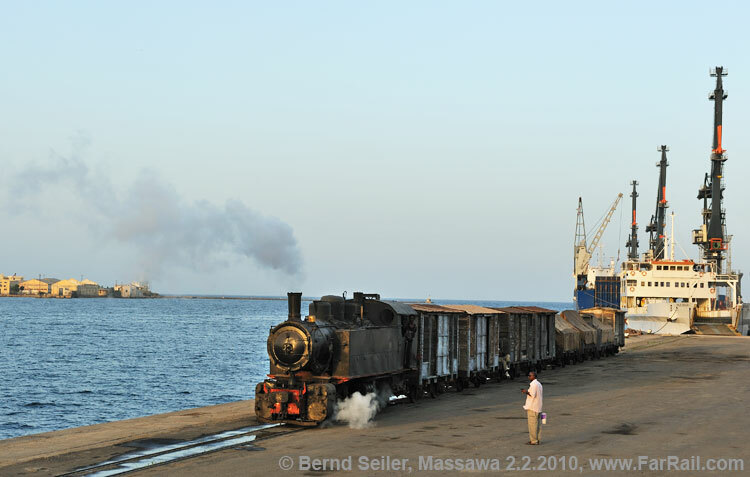 Of course, the whole length of the railway between Massawa and Asmara is spectacular. But you need to keep in mind that it’s close to impossible to get every position and every situation within the few days we’ll stay in Eritrea. Rest assured that we’ll offer many good opportunities for exciting photos and videos. 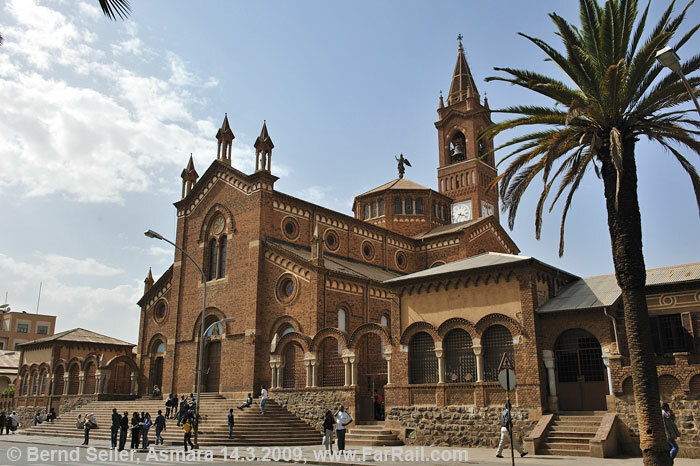 The capital of Eritrea, Asmara, has an irresistible Italian flair. Whether you like a pizza or a Cappuccino in the afternoon in a garden restaurant the” Dolce Vita” is everywhere in the streets of Asmara. The Art Déco style buildings give the city a real Italian touch. It’s on the list of prospects for world heritage status. If you want, you can stay a bit longer here for a holiday. You’ll not be bored! 08.03. Flight from Europe with Egypt Air (member of Star Alliance) to Asmara the capital of Eritrea. Connecting flights from Berlin, Wien, Paris and other cities are avalaible. 11.03. After early breakfast we’ll continue our trip into the gorge beyond Keren. The former line is impassable for our 4wd car, so we’ll walk along the abandoned line for about three hours up to tunnel no 4  the last tunnel of the line. We will climb down to the main road and go to Agordat by 4wd car (depends on permission). 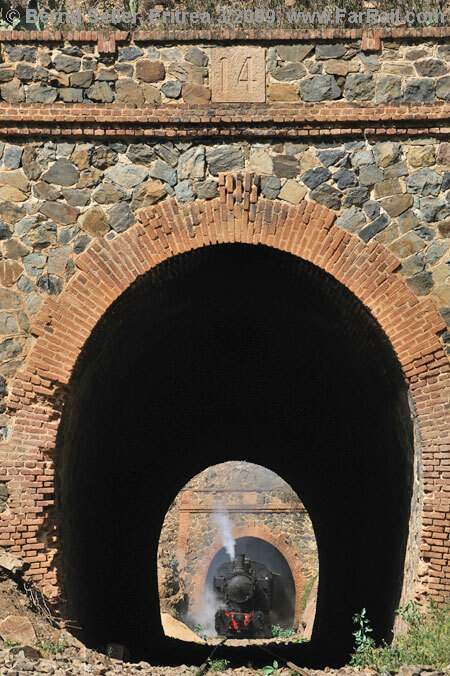 On the way we will see some more relics of the railway line and especially the big iron girder bridge near Agordat. In the afternoon we’ll return to Keren. Hotel in Keren. 12.03. After breakfast we return to Asmara. This afternoon we visit the Art Déco buildings. We will see many interesting witnesses of the “Italian School” like the former Fiat garage, the Cinema Imperio and Odeon, Asmara Brewery, Bar Cilli and many more. Hotel in Asmara. 13.03. 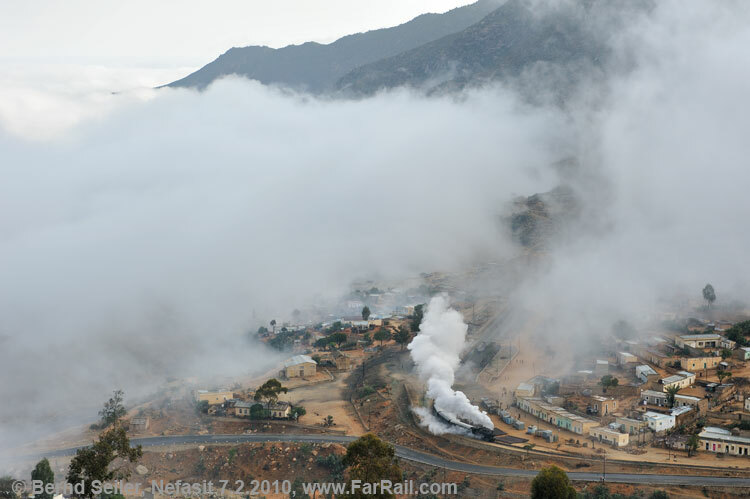 Free time in Asmara, or ride the scheduled tourist train down to Nefasit and back (50 Dollars will be charged for this). At lunchtime meet the group arriving from Europe. 12.03. Flight from Europe with Egypt Air (Star Alliance member) via Cairo to the capital of Eritrea, Asmara. 14.03. 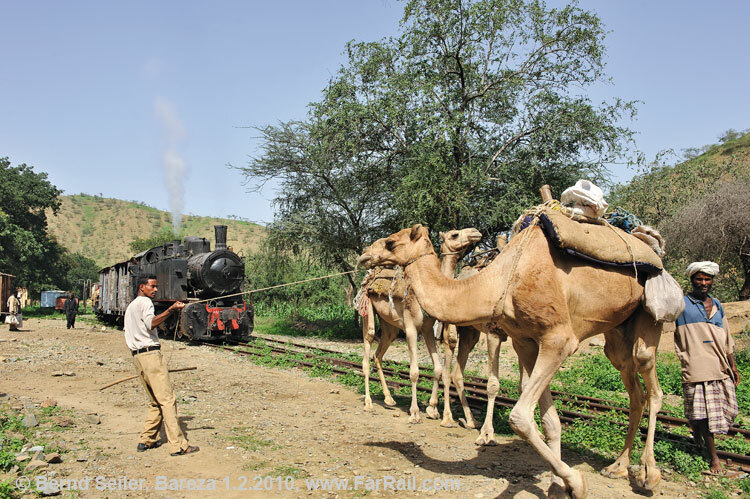 In the early morning we’ll board a mixed train, hauled by a 442 Mallet which will bring us from Asmara to Ghinda. Between Arbaroba and Lessa we’ll take some pictures of our train in breathtaking countryside. In Ghinda we’ll drop the passenger car and return as a freight train uphill to Embatkala and beyond. 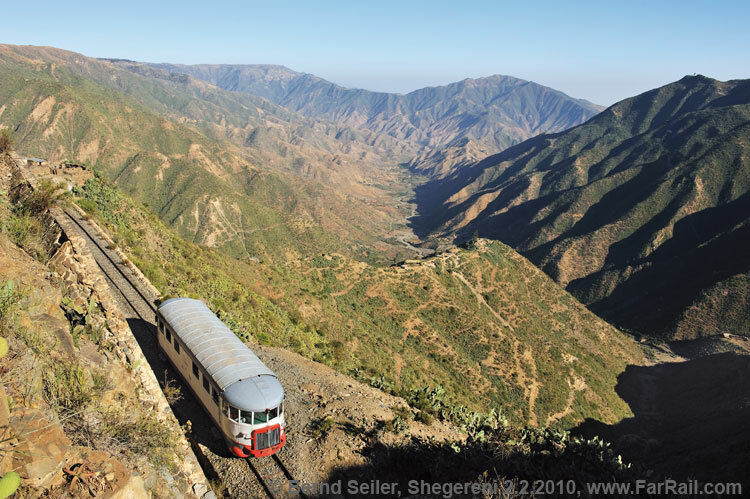 From there our train will roll back to Ghinda while we go by charter bus back to Asmara. 15.03. In the morning we’ll go again to Arbaroba but this time with the 1935 built Fiat railcar, the so called “Littorina”. Our charter bus will follow the railcar on the road. If you like panorama views you should take the bus. Around 10.30 hrs we’ll continue by charter bus from Arbaroba to Ghinda. From there we’ll continue behind steam down to Bareza where we’ll take water. Afterwards we steam uphill again, from Bareza back to Ghinda through a scenic and partly narrow, rocky valley. By charter bus back to Asmara. 16.03. We’ll go back by charter bus to Ghinda. 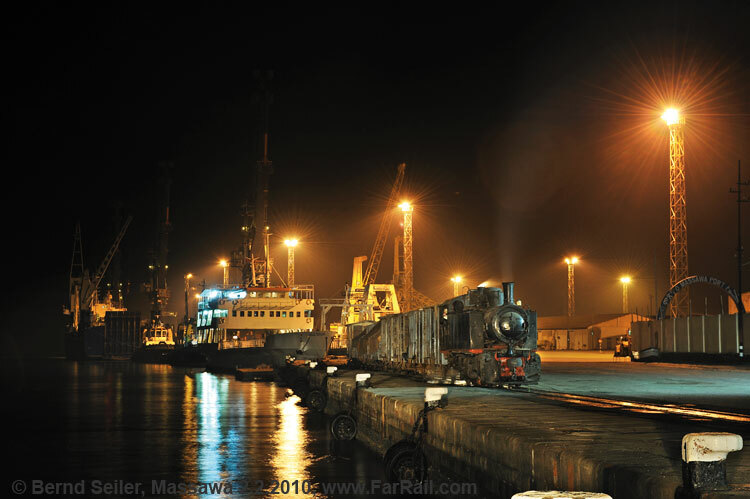 We board our mixed train there and will roll down to Massawa. The afternoon is reserved for a visit to the harbour (depends on the permit). A freight train will shunt for our group in the harbour. One of the main shots, a train leaving the harbour island to the main land, will be arranged as well. When permitted again we’ll arrange some night shots in the harbour. Hotel in Massawa. 17.03. In the morning we’ll head directly to the long and photogenic viaduct near Moncullo. From there we’ll continue to Mai Atal where we’ll arrive about 10am. We’ll then return by charter bus to Massawa to spend some time in the historic city centre and have lunch. In the afternoon we’ll return to Mai Atal and continue uphill to Damas. Back to the main road, where our “bus” is waiting. We ride on the back of a truck that is able to manage the rough way from Damas to the road. Hotel in Massawa. 19.03. With our charter buses we’ll return to Nefasit. 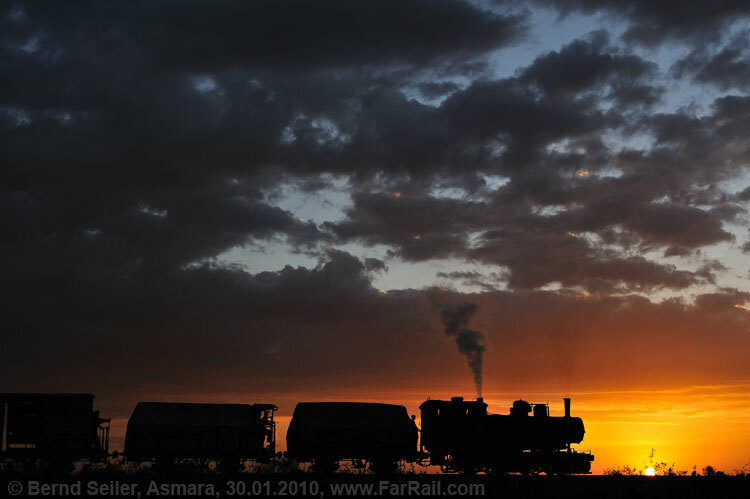 Aboard a freight train we’ll go to Asmara. Up to Arbaroba we’ll have a freight train. In Arbaroba a second locomotive with a passenger train will wait for us. After some scenes with passengers boarding the train we’ll continue as a long, mixed train, double headed with two locos of class 442 in the best afternoon light to Asmara. 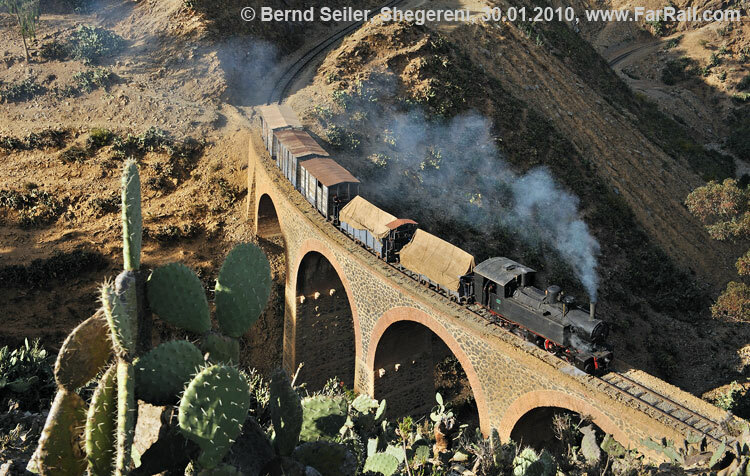 Our passengers will stay in the train up to Shegereni, so we’ll experience a real passenger train. Our hotel in Asmara is booked through until we need to leave for our night flight back home. 20.03. About 1.30 hrs, charter bus to the airport and return flight with MS834 to Cairo with connections to Europe. 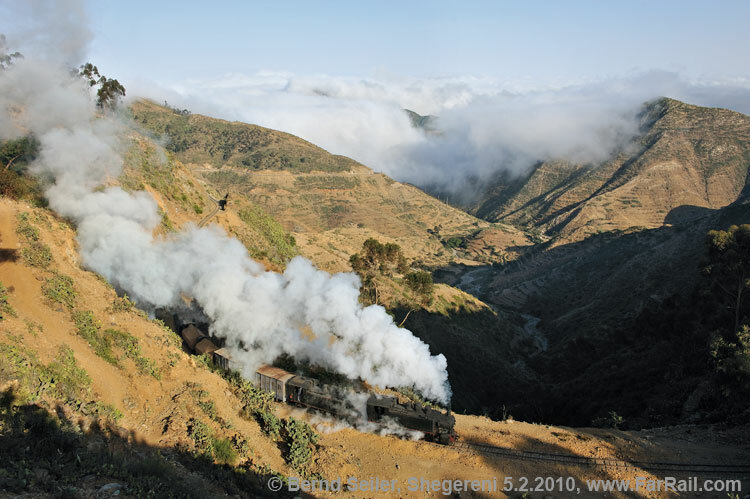 Today a Breda 0-4-0 will be under steam for shunting operations in Asmara. After extensive shunting in the main station of Asmara with several options for glint shots our 220 will go up to the workshop at Asmara, where we’ll take additional pictures of this locomotive with authentic looking movements. 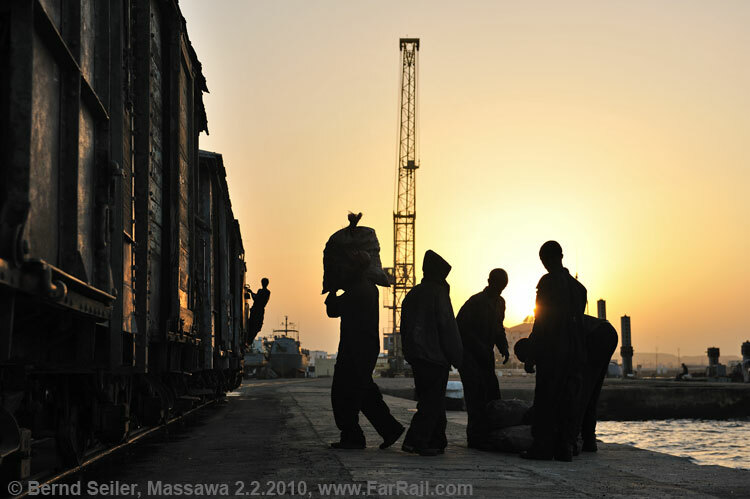 In the late morning we’ll visit the workshop of the railway at Asmara. In the afternoon our 220 will pull 440 008 out of the depot and we’ll see the preparation of this locomotive for the next day. Long 440-day! Early morning call to get on the bus to Nafasit. On the very photogenic section Nefasit  Arbaroba with plenty of tunnels, we’ll use the early morning light to make some remarkable pictures. Lunch break is planned in the destroyed station at Lessa. In the early afternoon we’ll set off from Lessa to Arbaroba. After taking water we’ll continue in the last light to Asmara. In the depot we’ll make some night shots. Probably the most spectacular section of the currently rebuilt part of the railway requires more attention, especially in the morning when clouds often cover some valleys while the railway line is already in sunshine. Hence we’ll leave our hotel in the early morning to reach our starting point between Arbaroba and Shegereni before sunrise. In the morning we'll take a freight train from Shegereni and 5 km beyond. From there we’ll start the ascent to Asmara in the hopefully beautiful morning light  maybe above the clouds. If we have more than 18 enthusiasts on the tour we’ll add the tiny round-shaped railcar “Littorinella” to the programme. 1.30 hrs charter bus to the airport and return flight by Egypt Air. We’ll not place any train lamps on the buffer beam of our locomotives because this wouldn’t be authentic. If you check historical pictures you’ll find out that the Italian locomotives almost never carried any lamps, only the German built locomotives used to have them. But, there is not a single German locomotive available. After a long search we found some original head lamps. Although they might not look nice for the taste of some Europeans we’ll place them sometimes on the buffer beam of a locomotive. 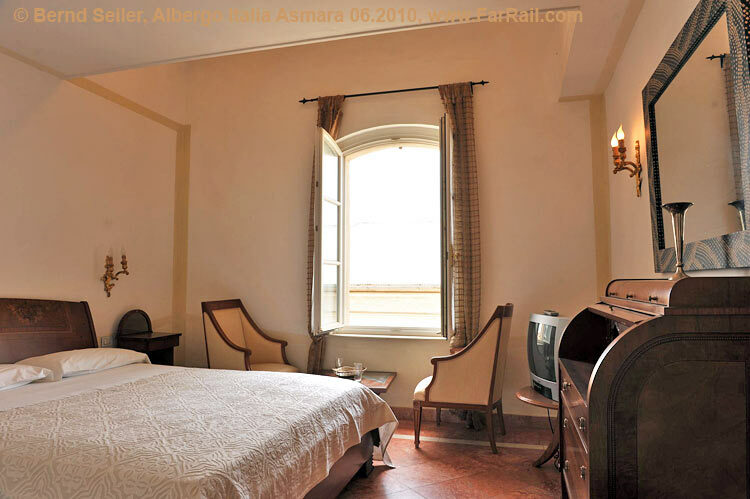 In Asmara we offer an option: if you like you can stay in a lovely four star hotel near the city centre. They have only big beds that’s why they are only suitable for single room bookings or travellers with their partner. It’s a classical hotel from the late 19th century which was, just recently, refurbished. Wireless LAN is available in the lobby of the hotel. Wireless Internet is available in the Lobby. Because we can’t offer a buffet-style dinner here, we didn’t include the dinner for this hotel. Instead we reduced the extra price for staying in this nice hotel to 190 Pounds (plus single supplement except when you’re travelling with your partner). For the excursion to Agordat you need a special permit  which is not issued to tourists. However, we have connections which allow us to get a special permit. Unfortunately the mind of some officials may change and we cannot be sure of getting to Agordat. In this case we’ll offer a replacement programme. Late registrations will be accepted if flights and hotels are still available and the maximum number of participants hasn’t been reached. Flights are usually more expensive when you register late. Land only: please deduct £480. Egypt Air business class will cost you some 1.200 Pounds more, please enquire. As a service to our UK-based clients FarRail Tours accepts and will continue to accept payments made out in Pounds Sterling until further notice. However, please note that from January 28, 2009, all prices quoted in Pounds Sterling are indicative only and are subject to change without prior notice. This measure was taken by FarRail Tours because of the unprecedented volatility in the international foreign exchange markets and its impact on the valuation of the Pound Sterling versus other major currencies, namely the Euro as FarRail Tours' accounting currency.